Have a cough that just won’t go away? Try this Natural remedy! It will work…and save you money. Combine all ingredients and mix in a blender. Serve warm, as the warmth of the liquid will not only soothe the throat and lungs, but also help break down mucus buildup. The seeds contain high levels of proanthocyanidins, natural chemicals packed with powerful antioxidant properties. They fight against lung cancer and promote positive lung cell growth. The texture can help soothe and protect the throat from irritation. Naturally fights bacteria and is helpful in attacking germs that colonize in the nose, sinuses and lungs. Infants under the age of 1 should never be given honey, as it can cause serious digestive complications or even death. It is a natural cold expectorant. 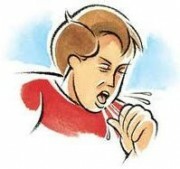 Makes the throat less vulnerable to irritation, which can cause coughing. Capsaicin, which makes the pepper spicy, exhibits antioxidant powers, which can prevent bacterial infections. It also makes mucus thinner, which helps move it out of the lungs.